Fatigue is the extreme tiredness resulting from physical exertion, prolonged stress, sleep deprivation and mental exertion. The fatigued person is tired and lacks energy to do anything. Chronic fatigue has a serious impact on your health and will for sure affect your work performance and success in life. Physical causes like overweight and pregnancy. Physiological causes due to personal problems that can cause anxiety. Mental health problems such as stress, depression or anxiety can make you feel more tired. Change in life style for example if someone is anxious about getting married. Decrease stimulants like caffeine, alcohol, sugar among others. 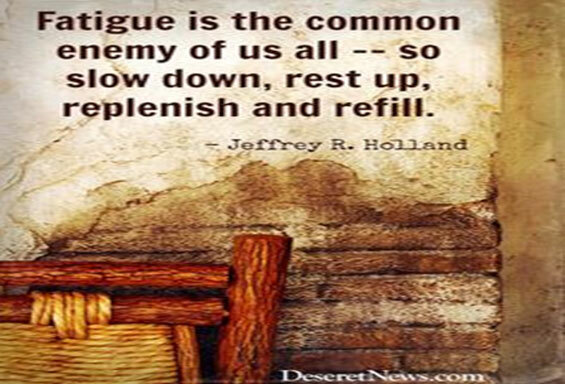 To overcome fatigue you have to develop a positive approach to life. Fatigue is comes about as a result of what you put in your mind.